Legion Ascend vs. Alpha Brain: Which Nootropic Is Better? 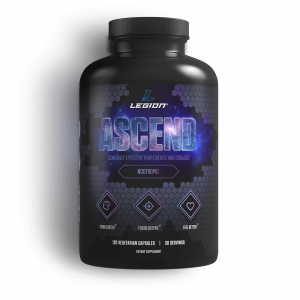 If you want to know how Legion’s Ascend compares to Onnit’s Alpha Brain in terms of ingredients, dosages, and effectiveness, then you want to read this article. Alpha Brain contains several ingredients that have been proven effective in scientific research, but most of its ingredients haven’t been. All ingredients in Ascend are backed by peer reviewed scientific studies. While some of the ingredients in Alpha Brain are included at clinically effective levels, others aren’t. All ingredients in Ascend are at clinically effective levels. If you feel that Alpha Brain gives you better results or are simply drawn to it, then it may be the better choice for you. If you want a 100% natural nootropic supplement with scientifically proven ingredients and dosages and nothing else, then Ascend is right for you. Alpha Brain is one of the top-selling nootropic supplements available, and for good reason. It’s was one of the first “brain boosting” supplements to hit it big (an example of the importance of first-to-market and time in the market), it boasts multiple celebrity endorsements, and it also boasts three studies that purportedly validate its cognitive benefits. My nootropic supplement Ascend, on the other hand, is a relative newcomer to the market but is already getting a lot of positive attention due to its ingredients and dosages. How does it compare with Alpha Brain, though? Alpha Brain’s formulation is better than many nootropic supplements on the market. It contains several high-quality ingredients that can improve your mental performance, but unfortunately, only one of them is clinically dosed, so it’s hard to say what it can really do for you. Furthermore, Alpha Brain contains several ingredients that don’t make sense given the formulation. If you ask me, this money could have been spent on different compounds or larger dosages of existing ones to make for an all-around better product. Ascend, on the other hand, contains much fewer ingredients than Alpha Brain (5 versus 12), but all are at clinically effective levels and were chosen for good reason. Thus, it’s likely to deliver more bottom-line benefits and results. Don’t just take my word for it, though. Let’s roll our sleeves up and find out why. What Does Science Have to Say About Alpha Brain? What Does Science Have to Say About Ascend? If a product doesn’t meet these simple criteria—if the majority of its ingredients haven’t been proven effective in sound research and most of the dosages are below the clinically effective levels—then it’s not “backed by science,” and probably not worth buying. Both Alpha Brain and Ascend claim to have scientifically validated formulations, so let’s see how they compare in this regard. Let’s learn a bit about each and break down the dosages per serving. Vitamin B6 is a water-soluble vitamin that’s involved in more than 100 biological processes in the body, mostly related to the metabolism of food and the production of hormones and red blood cells. It’s also a critical nutrient for proper brain functioning and mental health, and lower levels of vitamin B6 have been linked to lower performance on memory tests in the elderly. This is why many nootropic supplements include B6 in their formulas, but studies show that supplementing with vitamin B6 doesn’t improve cognitive function or mood. It’s an important vitamin for mental health, but superdosing isn’t going to give you any further benefits. Since vitamin B6 hasn’t been shown to benefit cognition, there’s no clinically effective dosage. As long as you’re reaching the recommended daily allowance (RDA) of 1.3 mg per day (and most of us do through diet alone), supplementing with more isn’t going to improve your mental performance. Therefore, the 10 mg of vitamin B6 in a serving of Alpha Brain is enough to prevent a deficiency if you aren’t getting enough from your diet, but it won’t otherwise boost your mental performance. L-tyrosine is an amino acid that can reduce stress and improve mood and cognitive function. Despite the fact that the body uses L-tyrosine to create the powerful neurotransmitters epinephrine, norepinephrine, and dopamine, supplementing with it only seems to improve mood and cognition during times of extreme stress such as prolonged cold or altitude exposure. It’s never been proven to improve focus or mood under normal conditions. Now, you could say that even if a tough workout or day at the office isn’t the physiological equivalent of subjecting yourself to 5 hours of oxygen deprivation and freezing temperatures, it could theoretically deplete your tyrosine levels to some degree. If you want to make that argument, then the clinically effective dosage for counteracting the negative effects associated with L-tyrosine depletion is 100 mg per kilogram (or 7 grams for a 150 pound man) or 10 grams per day. The L-tyrosine in Alpha Brain is part of their proprietary “Flow Blend,” which means it contains somewhere between 160 and just under 650 mg per serving. (Ingredients in proprietary blends are listed in order of dose. L-tyrosine is listed first, so it could be as high as ~650 mg if the other ingredients are almost nonexistent, or as low as 160 mg if all of the ingredients are dosed equally). Therefore, the amount of L-tyrosine in a serving of Alpha Brain is well below the amount you’d need to reduce stress and improve mood and cognitive function. L-theanine can reduce feelings of stress and improve focus by itself, but its main benefit is taking the “edge” off of caffeine. In other words, taking L-theanine with caffeine helps you reap the benefits of caffeine, without feeling overstimulated. The clinically effective dosage of L-theanine is 100 to 200 mg per day, and for cognitive purposes, it’s typically included in supplements at about twice the amount of caffeine (100 to 200 mg of L-theanine to 50 to 100 mg of caffeine). The L-theanine in Alpha Brain is part of their proprietary “Flow Blend,” which means it contains between 150 and 300 mg per serving. Therefore, the amount of L-theanine in a serving of Alpha Brain is enough to improve focus, mood, and alertness, and reduce the risk of overstimulation from a typical dose of caffeine. Oat straw extract is a highly concentrated form of the Avena sativa plant, which is the plant that oatmeal comes from. This plant has been used as an herbal medicine for hundreds of years, and some people claim that it’s especially good for alleviating neurological fatigue and improving stress response. Unfortunately, the only evidence we have for this is animal research, so we don’t know how it might help in humans. As far as brain boosting goes, studies show that oat straw extract can improve attention, concentration, and cognitive performance in healthy people and the elderly in the short-term. As time goes on, though, these benefits disappear. Exactly how it does this isn’t clear, but high-dose oat straw extract does seem to increase blood flow to the brain, so that’s a plausible mechanism. The clinically effective dose of oat straw extract ranges from 1,250 to 1,600 mg. The oat straw extract in Alpha Brain is part of their proprietary “Flow Blend,” which means it contains at most 200 mg per serving. Therefore, the amount of oat straw extract in a serving of Alpha Brain is below the amount you’d need to improve cognitive performance in the short-term, and won’t produce any benefits over the long term. Phosphatidylserine is a chemical your body uses to produce cell membranes, which are the barriers that separate the interior of cells from everything outside them. It’s found in large amounts in brain tissue, and plays a vital role in neural function. Early research showed that supplementing with phosphatidylserine could reduce stress and improve memory and cognitive function, but there’s a catch. Most of these studies used phosphatidylserine derived from bovine (cow) brain tissue, and after mad cow disease blew up, virtually all of the supplements started using soy-derived phosphatidylserine. Does the soy-derivative work as well as the bovine? We don’t know yet. For the sake of our current discussion, though, let’s just assume that the soy variety can indeed produce the same benefits as the bovine. The clinically effective dosage of phosphatidylserine typically ranges from 200 to 400 mg, and the phosphatidylserine in Alpha Brain is part of their “Flow Blend,” which means it contains at most 160 mg. Therefore, the amount of phosphatidylserine in a serving of Alpha Brain is below the clinically effective dosage that you’d need to improve memory and cognition and reduce stress. Cat’s claw (Uncaria tomentosa) is a vine native to the jungles of South and Central America that’s been used in traditional medicine for centuries. It’s typically taken for its anti-inflammatory properties, and research shows it can also boost immune function by increasing white blood cell count. Why is it in many nootropics, then? Well, one study found it can reduce fatigue and improve quality of life in patients with advanced cancer, and for your average supplement marketer, that’s evidence enough. Throw it in there! Unfortunately, there aren’t any studies that show cat’s claw can improve quality of life or brain function in otherwise healthy people. It’s also not even clear what compound in cat’s claw is responsible for these effects, although some scientists think it might be related to DNA repair. So, while cat’s claw most likely won’t improve your brain function, the amount of cat’s claw used in the studies cited above is between 250 and 350 mg per day. Therefore, there’s no good evidence that cat’s claw extract improves brain function in healthy people, but if it does, the 350 mg in a serving of Alpha Brain should be enough to do it. Alpha-GPC (Alpha-glycerophosphocholine) is a natural compound that may be able to increase power output in athletes and appears to help mitigate cognitive decline in the elderly. It works primarily by increasing levels of choline in the body, which is a nutrient that turns into acetylcholine, an important neurotransmitter for learning and muscle contraction. Now, no studies have directly shown that taking Alpha-GPC improves cognitive performance, but given how it affects acetylcholine levels and what we know about acetylcholine’s role in learning and brain health, it’s reasonable to assume that over time Alpha-GPC might improve cognitive function. The proper dosage of Alpha-GPC depends on what you’re taking it for. For delaying the onset of Alzheimer’s and protecting against dementia, 1,200 mg per day seems to be ideal. For increasing strength and power output, anything from 250 to 600 mg per day can work. For increasing acetylcholine levels and (potentially) cognitive function, 250 to 600 mg per day is likely the best choice, and 250 mg seems to be equally effective as 500 mg. The Alpha-GPC in Alpha Brain is part of their proprietary “Focus Blend,” which means it contains between 80 to just under 240 mg of Alpha-GPC per serving. Therefore, the amount of Alpha-GPC in a serving of Alpha Brain is just under the lowest clinically effective dosage for raising blood choline levels and enhancing cognition. Bacopa monnieri is an herb native to southern India, Australia, Europe, Africa, Asia, and North and South America that has long been used to treat various neurological health disorders and to aid memory. Research shows that bacopa can improve cognition and memory performance, improve mood, and reduce stress and depressive symptoms. Clinically effective dosages of bacopa range from 250 to 300 mg when the bacoside content is held at 55%, and higher dosages are used if the bacoside content drops. What you’re really going for is 160 mg of total bacosides, which is what you’d get from 300 mg of bacopa at 55% of bacosides. The bacopa in Alpha Brain is part of their proprietary “Flow Blend,” which means it contains between 80 and 120 mg per serving. They also don’t list the bacoside content of the extract, but even if it was 100% bacosides (it’s not), it would still only be about one-half to two-thirds as much as you’d need for it to be effective. Therefore, the amount of Bacopa monnieri in a serving of Alpha Brain is far less than the amount you’d need to improve cognition, memory, and mood and reduce stress. Huperzia serrata is an herb that’s used in traditional Chinese medicine mostly to protect against dementia and Alzheimer’s disease. It contains a molecule known as huperzine-A that inhibits the breakdown of acetylcholine, a neurotransmitter involved in learning and muscular contraction. It accomplishes this by blocking an enzyme (acetylcholinesterase) that breaks down acetylcholine, which produces a relative rise in acetylcholine levels. Now, this theoretically could improve learning and cognitive performance, which is why it’s a popular nootropic supplement, but research hasn’t confirmed this yet. There’s something else people should know about huperzine-A before supplementing with it. After ingested, blood levels of the molecule rise rapidly and peak after about 60 minutes, but the half-life (the time it takes for half of it to be removed from the body) is 12 hours. In other words, huperzine-A remains in your body for a long time, and if you take it every day, you would essentially never stop blocking activity of the acetylcholinesterase enzyme. While this may be helpful for treating certain medical conditions like Alzheimer’s, this wouldn’t be ideal for those of us who are healthy. In fact, the body may simply adapt by creating more acetylcholinesterase to restore homeostasis, and if it did, your acetylcholine levels would crater once you stopped taking huperzine-A, which is the opposite of what you wanted in the first place. Now, in terms of dosing, clinically effective dosages of huperzine-A range from 200 to 800 mcg per day, with 400 mcg being a reasonable middle ground between the two. Now, the Huperzia serrata in Alpha Brain is part of their proprietary “Focus Blend,” which means it contains between 1 and 80 mg per serving. It’s impossible to know how much huperzine-A this provides, though, because the amount in any given plant extract can vary greatly based on the growing conditions and how it’s processed. Thus, we would need to know what percentage of the extract is actually huperzine-A. Therefore, it’s impossible to tell if a serving of Alpha Brain contains enough huperzine-A to increase acetylcholine levels in the brain, improve cognitive performance, or produce any unwanted negative side effects. Leucine is an amino acid that stimulates protein synthesis by activating an enzyme responsible for muscle cell growth known as the mammalian target of rapamycin (mTOR). Most people get enough leucine from their diets, so supplementing with it isn’t going to help with muscle growth, but more importantly, there’s no evidence leucine helps with cognition, so it’s unclear why it’s in Alpha Brain. The leucine in Alpha Brain is part of their proprietary “Fuel Blend,” which means it contains between 20 and 65 mg per serving. You need several grams of leucine per meal to see any increase in protein synthesis, so this tiny dose won’t even do that. Therefore, the amount of leucine in a serving of Alpha Brain isn’t enough to have any effect on protein synthesis, and won’t benefit your brain function or health. Vinpocetine is a synthetic compound resembling a substance found in the periwinkle plant Vinca minor that can help protect brain cells from oxidative damage caused by various chemicals like dopamine and glutamate. Research also suggests that vinpocetine can enhance blood flow to the brain, reduce reaction time, and protect against toxin-induced memory loss. On the other hand, an extensive review published in the esteemed Cochrane Library determined that there isn’t enough evidence to support the claim that vinpocetine can protect against dementia or cognitive impairment, and that there’s no credible evidence that it can enhance brain function or memory to above-average levels. So, all things considered, it’s not a very exciting compound for use in nootropics. The amount of vinpocetine used in the research on memory loss and reaction time was around 40 mg, and the dosages for protecting brain cells and increasing blood flow ranged from 15 to 20 mg. The vinpocetine in Alpha Brain is part of their proprietary “Fuel Blend,” which means it has somewhere between 20 and 32 mg per serving. Pterostilbene is an antioxidant found primarily in almonds, grape leaves, and blueberries. It’s chemically similar to and better absorbed than resveratrol, but doesn’t seem to reduce inflammation as effectively. As far as cognition goes, there’s just a single rat study that found that a dosage of 10 mg helped preserve cognitive function after consuming a toxin. What does that mean for us humans? Theories abound, but until further research is conducted, we just don’t know. The pterostilbene in Alpha Brain is part of their proprietary “Fuel Blend,” which means it has no more than 20 mg per serving. Therefore, assuming pterostilbene works in yet-to-be-established ways to benefit cognition, the amount in a serving of Alpha Brain may be enough to do it. What About the Scientific Studies on Alpha Brain? Alpha Brain is one of the few nootropics on the market that has clinical studies to back it up. Specifically, three studies have been conducted on it, and all were funded by Onnit, the manufacturer of Alpha Brain, and performed by the same group of researchers, two of whom are paid consultants for Onnit. 1. A proof of concept study on Alpha Brain that reported it improved verbal memory and executive functioning. This study was limited in scope and done to determine if it was worth doing a real, full-fledged study on Alpha Brain. Ironically, out of 16 different tests subjects took in this study, the group that took Alpha Brain improved on just one test. Additionally, one of the tests went the other direction: the group that took a placebo did better than the group that took Alpha Brain. It’s also worth noting that this study hasn’t gone through peer review or been published in any scientific journals. 2. A randomized controlled trial on Alpha Brain that reported it positively influenced brain activity and produced improvements in attention and cognitive function. The effects seen were minor, however, and due to the way the study was set up, it’s hard to say that Alpha Brain was the primary cause. The researchers also used a variety of statistical tests to manipulate the data without explaining why, which is often a sign of trying to steer or exaggerate the results. This study also hasn’t gone through peer review or been published in any scientific journals despite being first presented two years ago. 3. A randomized controlled trial on Alpha Brain that reported it improved verbal memory. This time, researchers put 63 people through 26 different cognitive tests, and, similar to the first study referenced, the group that took Alpha Brain performed better on one test. To make matters worse, when you dig into the data, you discover that the authors failed to mention that the people who took a placebo performed slightly better on several tests than those who took Alpha Brain. This study did go through peer review and was published in the journal of Human Psychopharmacology in 2016. 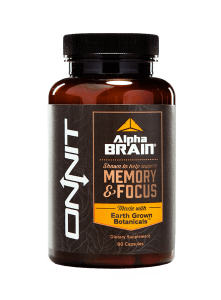 Alpha Brain hasn’t performed nearly as well in clinical studies as Onnit would have you believe. Two randomized controlled trials found that Alpha Brain improved cognitive performance and brain activity associated with attention and cognitive function. In both cases, though, the effects were minor and the studies were riddled with flaws and never went through peer review or got published in a scientific journal. One randomized controlled trial on Alpha Brain did make it through peer review, and it found that, out of 26 different psychological tests, people who took it performed better on one test. Just as telling is the fact that the people who took the placebo did just as well or better on the other 25 tests. So, while it’s a good sign that Onnit is doing research on their flagship product, the current weight of the evidence is that Alpha Brain isn’t very effective. Agmatine is a “chemical messenger” of the nervous system (neurotransmitter) that helps protect nerve cells against damage and interacts with the pain and pleasure pathways in the brain. Neurons can’t grow and sustain themselves while under duress, and while agmatine isn’t necessarily an antioxidant, it can limit the damage caused to neurons by various stressors. Agmatine is an interesting molecule in that it provides only mild benefits on its own, but really shines as a synergist with other nootropics (it makes certain types of compounds much more effective). In addition to its synergistic effects, research shows that supplementation with agmatine can enhance the activity of serotonin in the brain, which can also help serotonin-based supplements or drugs become more effective. It can also mitigate the decrease in neurotransmitters and subsequent depressive symptoms caused by stress. I’m partly relying on animal research with agmatine because while it lacks human studies for our purposes here, cognitive effects have been demonstrated in the rodent model and based on the human studies currently available, I believe they can likely be extrapolated to us, as well. The clinically effective dosage of agmatine hasn’t been established yet, but up to 3.5 g has been shown to be safe in humans and the nootropic range (based on animal research) appears to be between 1.6 to 6.4 mg per kilogram of body weight, so 110 to 440 mg for a 150-pound person. Therefore, the 500 mg of agmatine in a serving of Ascend is enough to safely reap its cognitive benefits. Therefore, the 330 mg of Bacopa monnieri (at 50% bacosides) in Ascend is at the level used in many clinical trials showing efficacy. Cytidine Diphosphate-Choline (CDP-Choline) is a compound that can reach the brain and provide it with choline—an essential nutrient for brain development and health—as well as a precursor to another vital nutrient, uridine. Research shows that supplementation with CDP-Choline can improve memory (and verbal memory in particular), mitigate cognitive decline as we age, and improve focus. The clinically effective dosage of CDP-Choline is between 250 to 500 mg for focus, and 500 to 1,000 mg for preventing cognitive decline. Therefore, the 300 mg of CDP-Choline in Ascend is enough to enhance focus. Therefore, the 300 mg of Alpha-GPC in Ascend is at a level that will reliably raise acetylcholine levels and potentially provide cognitive benefits. Uridine monophosphate is uridine bound to a substance called phosphoric acid that helps the body create phosphatidylcholine, which is an essential building block for nerve cells (neurons). We want our brains to be able to produce optimal amounts of phosphatidylcholine, and especially when we’re also supplementing with natural brain growth agents like Bacopa monnieri (also in Ascend). While human research on uridine is currently sparse, the data we do have suggests that it can . . .
Increase the growth of neurons. Protect the brain from oxidative damage, which can improve memory by preventing a decrease in cognition. Sustain memory during periods of minimal mental stimulation. Reduce the time it takes to fall asleep and improve sleep quality. In case you’re wondering why I’ve included an ingredient based on animal research alone, uridine is a vital nutrient for brain growth. It’s used to make neuron membranes and is a limiting factor in how many neurons can be produced at any given time (the more uridine there is in your body, the faster and better your brain can repair itself). Thus, it’s no surprise that, when supplemented, it can produce cognitive benefits in rodents, and I strongly believe that these effects will be replicated to some degree in humans as more research is done. The clinically effective dosage of uridine hasn’t been established yet, but Ascend contains 250 mg as it’s the human equivalent to what’s required to produce the desired effects in animal research. Therefore, the 250 mg of uridine monophosphate in Ascend is likely to produce the desired nootropic effects we’re after. As far as nootropics go, you can do worse than Alpha Brain. It contains several ingredients that can improve mood and cognition, like L-theanine, Alpha-GPC, and Bacopa monnieri, but it also contains several that can’t or probably can’t, like vitamin B6, L-leucine, and pterostilbene. Dosages are hit-and-miss. Several of Alpha Brain’s ingredients are at clinically effective levels (L-theanine, vinpocetine, and pterostilbene), several aren’t (L-tyrosine, Bacopa monnieri, oat straw extract, phosphatidylserine, and Alpha-GPC), and one is unknown (Huperzia serrata extract). Alpha Brain also boasts several studies that are used as definitive proof of its effectiveness, but when you look at them for yourself, you’re quickly underwhelmed. Each study had major limitations or outright flaws, the effects seen were minor, and in two of the studies, there was very little difference between those who took Alpha Brain and those who took a placebo. Lastly, at just shy of $80 for a 45-day supply, Alpha Brain is also very expensive, and especially for what you’re getting. Ascend, on the other hand, only contains five active ingredients, but each is scientifically validated and included at proper, clinically effective levels. Furthermore, Ascend was developed to be a “multivitamin for your brain,” so to speak—as something that you take to provide your brain with vital nutrients that supports and enhances your focus, memory, mental speed, creativity, and mood, as well as your overall brain health. If you aren’t worried about the proprietary blends, small doses, and unproven ingredients or feel particularly drawn to Alpha Brain for whatever reason, then it may be the better choice for you. If you want a 100% natural nootropic with scientifically proven ingredients and dosages and nothing else, however, then Ascend is right for you. What’s your take on Ascend vs. Alpha Brain? Have anything else to share? Let me know in the comments below!